2016 Israel is an equal and feminist country, or at least we like to say that it is. We have come a long way, but there are still gaps between men and women. Women often earn less than their male peers, and may suffer from chauvinism. 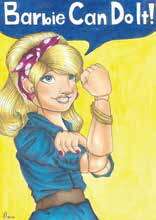 The cartoon uses a pair of icons on two sides of the coin to depict the pretense of feminism: Rosie the Riveter (“We Can Do It!”) and a Barbie doll, which is the chauvinist model. Many people in society claim that they are Rosie, but are, in fact, Barbie. Which one are you? “Barbie Can Do It” by Yali Nitzani for the “Cartoon Criticism Care” competition, the Jerusalem Press Club (JPC). Help this competition go global!